Not to mention in the mere 9 months he has been alive he has also chewed up a full bottle of Fruit2O overtop of my driver’s seat, peed in my parent’s pool, brought what I think was a dead animal into the house and up onto my bed, and has destructed, destroyed, and partially digested every single toy he has ever owned. Oh yeah, and he eats goose poop. Most of you will read this post and think what is she crazy baking cookies for a dog that acts like that! But, some of you (suckers like me) will turn to your own dog, look at that cute little face, your heart will melt, and you’ll understand just where I’m coming from. 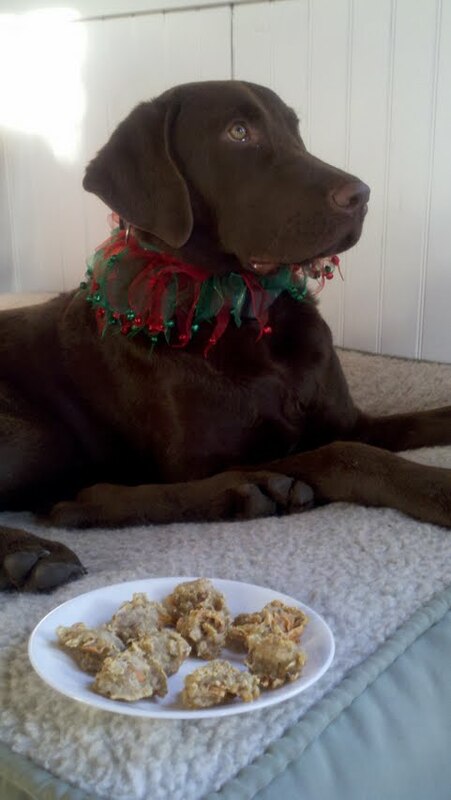 Merry Christmas to all the pampered pups out there!! Mix all ingredients together until well combined. Drop Tbsp-fulls onto greased baking sheet. Bake at 350 for about 10-15 minutes.